Lore and his army of Borg individuals manipulate Data into helping them perform deadly experiments on his captured shipmates. It's interesting that Troi can sense Data now that he has emotions. What does this say about his spiritual concerns, as expressed in "Tin Man"? One thing I've noticed since the fourth season is how the cliffhanger openings help smoothen out the transition from one season to the next. On one hand, this lends a sense of continuity to the show, but on the other, I kind of miss the feeling of being reintroduced to everything like we are at the start of "Evolution." Data's brainwashing is awfully sudden. It would have been more believable if the Enterprise had taken a much longer time to get to him, thus allowing Lore a few days to work. The Borg experiment victims are pretty freaky and disturbing. There are a lot of plot points--the artificial life warring against organic, the experiments on humans to turn them artificial, etc.--that remind me of Mass Effect. Of course, this is much older. The effects are much more consistently seemless when Lore and Data are on screen at the same time, a definite improvement over just one episode ago. When Data points the weapon at Picard at Lore's behest, it's good that Picard stands firm and says nothing, showing a resolute faith in the power of right and wrong. It's subtle and subtextual, but Picard has had to deal with his own demons throughout this story and they are resolved at the same time as Data's. I love Lore's pupils vanishing as he is deactivated, kind of like an old computer screen shutting down. Number of episodes in which a member of the crew is subverted by an alien lifeforce: 26. This one's iffy, but I'm going to go ahead and count Lore's manipulation of Data. This is a good episode for wrapping up the Lore storyline--though as Lore is an artificial lifeform who has merely been disassembled, there's still a tiny bit of potential for more--and dealing with the ramifications of "I, Borg." 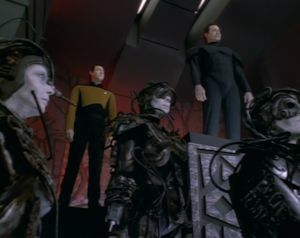 Though this is technically a Borg episode, the Borg are abnormal, wholly different from what we've come to know as Borg, and thus it is more helpful to look at it as a Lore episode, in which Lore has built himself an army that is devoted to his psychotic vision. There is some character development for Data (and Picard), and the dangling plot thread of the emotion chip seems like an irresistable hint of things to come. I've always wondered what happened to Hugh and the splintered Borg, but alas, we never learn their ultimate fate.